As you might know, I spent Christmas and New Year in Northern Ireland. While we were there we met a friend for lunch in Belfast and decided to go to Bootleggers. This was my first time eating there so I thought I would do a little review. Also a little blog update for you - you might care/notice, or you might not - but I am goign to cut down the amount I am posting on here for the foreseeable future- exams, applying for jobs, new YouTube project etc. So I think I'm going to cut it down to twice a week (plus the Silent Sunday tag). But back to Bootleggers- the setting is very cool, as well as being very "cool", sorta sterotypically cool/hipster. Which is nice to sit in although can be quite overdone these days, so if you're sick of that already then stay clear! I decided to order the Tacos, and you get to pick any three from the menu for £8. I picked one from the specials- a chicken goujon one, the lamb with tzatziki and pomegranate and the cola braised pork with mango salsa. Overall the taco experience was okay, I was terribly disappointed there was no fish taco option and the lamb one was delicious. But I thought the other two kinda missed the mark, plus I thought it was a bit expensive for a meal with no sides. I didn't fancy paying £3 for some chips (making it £11) and I would even have preferred 2 tacos and a side! Matty went for some burger, and had no complaints there. Whilst our friend went for what I think is called the Powerful Fries which she really likes EXCEPT be warned, the bacon is vegetarian bacon. So she would recommend ordering it without the bacon! Bootleggers have had some not so good reviews in the past and a recent rebranding. Overall I liked the place, the food was perhaps a little expensive and it was typically hipster but it is really handy if you're in the centre of town! 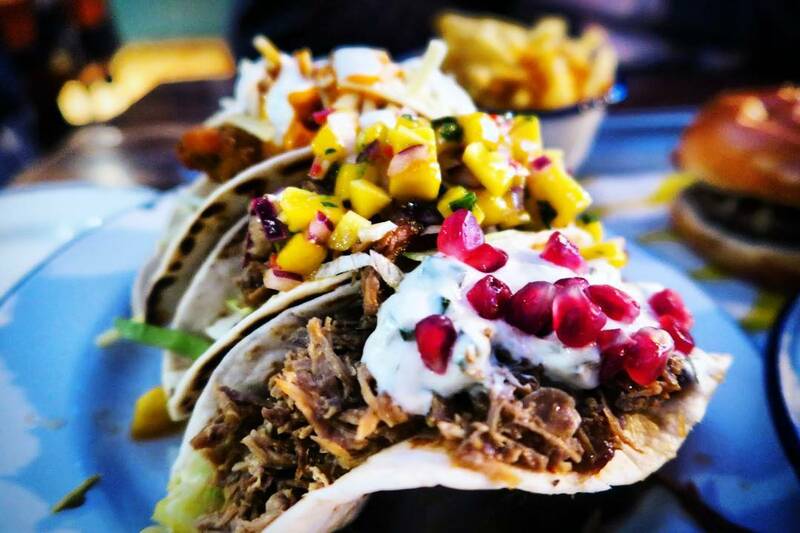 The tacos look lovely, it's a shame they didn't have a fish version as you say. Yeah they were really nice, just love me a fish taco! Same, I'm so easily swayed by food pics!